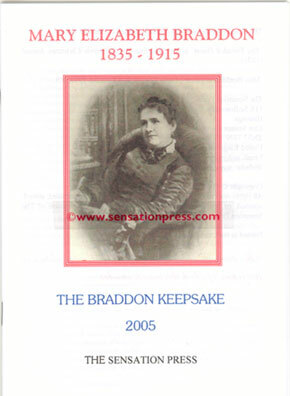 Paperback published to mark 180 years since Braddon's birth and the centenary of her death. 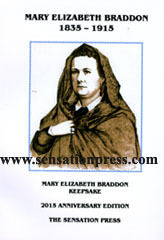 Contains six short stories by Braddon, including a story discovered after the publication of The Literary Lives of Mary Elizabeth Braddon and Braddon's first ever published story. Three of the short stories have never been published before in book form. A schoolboy finds himself claimed by a ghostly goblin. A long-lost will threatens the future of a book collector and his daughter. A stuffy gentleman becomes jealous of his fiancee's previous love. An anarchist bomb plot terrifies a cathedral. A mother is determined her daughter will never have an unhappy marriage like her own. A barrister plans revenge upon his unfaithful wife. Mary Elizabeth Braddon in Richmond - the previously unpublished paper given by Jennifer Carnell at Richmond Museum; an Edwardian essay about Braddon by Edmund Downey; an interview with Braddon; and four articles published after her death. The cover shows an early portrait of Braddon. Limited to 100 copies signed and numbered by Jennifer Carnell. The previous 2005 Braddon Keepsake is now rare. 'Miss Braddon at Home - A Chat With the Popular Novelist'. 2005 edition is out of print.